Learn simple rules for meaningful recognition in the workplace. You might be thinking, “Wait a minute. But I thanked MY team last year…” I would bet some of those 65% who didn’t feel they received recognition in the Gallup study had at least some attempt by their manager to do so, but for whatever reason it was not meaningful or frequent enough to impact their memory. So how can you be sure your recognition stuck with your team? Some simple rules to meaningful recognition are that it has to be frequent and meaningful. Spotting recognition throughout the year gets more mileage than one annual bonus. Recognition that is specific and personalized is more meaningful than blanketing the whole team. Thank you notes: Not in email (although those are nice too), but a real, handwritten note. You will see people hang these in their workspace for years. And as always visible reminders, they have an impact long after the first time it is opened. These are especially great for people who don’t always like to be recognized in front of others. Thank you note “Pay It Forward”: If you are already great at thank you notes and want to up your game, try paying it forward with your team. You write some notes, and then anyone who receives one gets a blank card to write one for the next person and it keeps on going. I once hand delivered 200 thank you notes in my office with a “pay it forward” chain! It was magic. 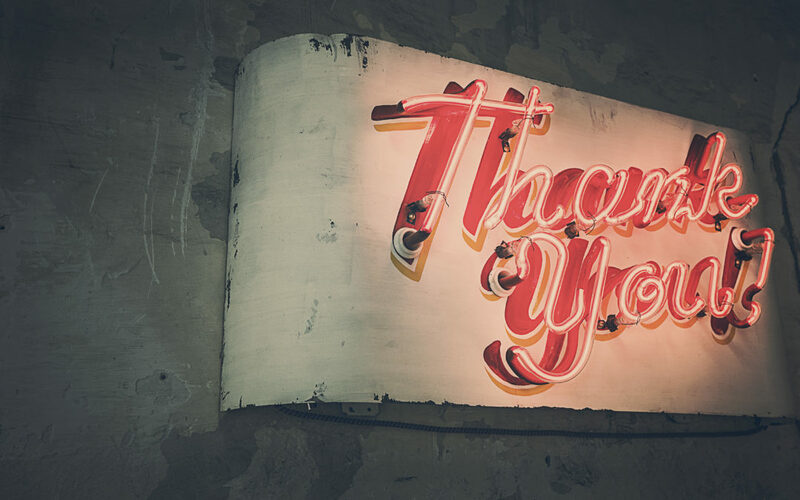 Say “thank you”: Make eye contact, slow down, say two full words (not thanks), and really mean it. What does not count in this category is the obligatory “thanks” after you just gave someone direction of work to do. Corny gifts: So maybe it’s not everyone’s style, but everyone loves a corny gift. Why? Because it is recognition! A few of my favorites (paired with a thank you note of course) are a can of Rockstar energy drink (because they are a Rockstar), Thanks-a-Lot girl scout cookies, Life Savers (because they are a lifesaver), or a trophy that I made with something funny on top of a trophy base. I literally have a box of trophy bases and a hot glue gun in my office. Gratitude feeds gratitude. As a leader, it can start with you. Feed the monster and see what comes out of it!